Founded in 1996, Nonnah’s was one of the first restaurants to set up shop in the Vista. Nonnah’s, a family owned store, was voted “Best of Columbia” seventeen years in a row by Free Times, The State Newspaper, The Columbia Metropolitan Magazine, and the Daily Gamecock. If you’ve already been to Nonnah’s you know what a great addition it has been to The Vista. They have a supper menu, brunch, full service bar with a wonderful list of wines, big frothy cappuccinos, and great desserts. I first came upon Nonnah’s one evening while looking for a place to camp out and work. I had been visiting a long-time friend in Columbia, South Carolina and this was a night he had to go to his evening MBA class. I was going to use this as an opportunity to get some work done. While looking for a decent place to work comfortably from, I walked up Gervais St, passed up a Panera, having spent way too much time there recently, I continued walking. I was heading towards the Starbucks figuring I’d work there unless I found something else more interesting, when I came across Nonnah’s. I poked my head in and I wasn’t sure if it was a full restaurant or something else. I went in and looked around, then spoke with a friendly woman working the counter. I said it looked like some kind of restaurant, bar, coffee house, fusion sort-of-thing. With a welcoming smile, she said that was pretty much what Nonnah’s was. I shyly asked if they had wifi and how late they were open because I had a lot of work to do. Happily, she said that was no problem and to just pick a place to sit down. I found a room towards the back near an unused fireplace. The lighting was dim and warm and I grabbed a table in the corner near an outlet. While there isn’t an abundance of power outlets, there is good wifi to get you online. 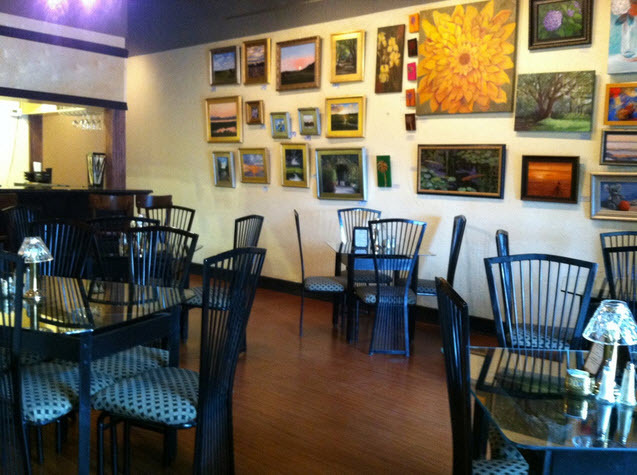 There is a lot of art hanging all over the walls from local, Columbia based artists for sale. I explored around the restaurant and found several rooms extending to the sides and all the way back into, what my friend later told me was one of his favorite local lunch places. Apparently Noonah’s took over their space when they moved in from across the street in February of 2014. While the plan was to get a small bite to eat for dinner, after seeing their menu, I caved. I ordered the petite filet, wrapped in bacon, and covered with blue cheese crumbles. It came with a side of mashed potatoes and steamed vegetables. That, and a recommended Cabernet, were delicious. I finished it off with a cup of excellent coffee and a slice of their Chocolate Temptation cake. I was a bad boy… but it was sooo good. Amazingly, even with so much food, I was still able to get through all my work I set out to do before my friend returned from class. When he arrived, we stuck around a little while longer while he had the salmon patties and a slice of lemon cheesecake for dessert. This entry was posted in Columbia, South Carolina and tagged food, free wifi, local art, open late. Bookmark the permalink. Didn’t know Nonnah’s was such a nice place to hang out and work, just knew them for their excellent desserts. Looks like they have a lot of space and a nice environment – good to know!